Welcome to the Broadband Genie mobile broadband provider hub. Below is a list of every mobile provider on our site plus buying advice and reviews. You can start comparing mobile providers and deals right away using the links in the navigation menu above. Our mobile broadband packages include SIM only, USB and Wi-Fi dongles, iPads and Android tablets and mobile accessories such as smartwatches, with a choice of pay-as-you-go, monthly and long term contracts. 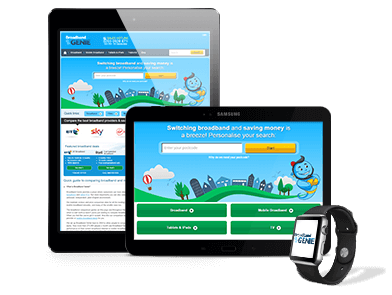 For further details of each mobile broadband provider click the links below to access our provider pages containing general information on their features and an overview of packages, plus reviews left by other Broadband Genie visitors. For buying advice and technical assistance be sure to visit our mobile broadband guides as well as our Features and Blog sections, and if it was a home broadband service you were looking for make your way to our home broadband hub. Mobile broadband performance is highly dependant on a strong signal so this is absolutely crucial. And of course you can also gauge signal strength by looking at the performance on a smartphone or other device. Going with the network you already use for phone service is a safe bet! Mobile broadband speed is a tricky one to judge. The providers quote very optimistic “up to” speeds that most of us will never see, so you’ll want to look at independent real-world testing for a more realistic picture. One of the best sources is Ofcom’s annual smartphone cities report, which tests 4G and 3G performance in several cities across the UK. However, this may not actually be all that important. Unless you have a specific reason to need the very best performance at any time, all the providers will be able to deliver acceptable mobile internet speeds, especially on 4G where the connections can comfortably match or exceed many home broadband connections. Many mobile networks also offer home broadband and other services, and it’s common for existing customers to get additional benefits if they choose a mobile deal from the same company. If this is likely to be a useful feature or add up to a significant saving it should factor heavily into your decision. In an effort to stand out in a highly competitive market, mobile networks offer free extras to tempt potential subscribers. This can include features such as free international roaming, free data for specific services, data allowances that rollover to the next month and discounts on goods and services. How much these affect your choice is for you to decide - they could be simply nice to have, or become an essential feature that puts one network above all others.